Robert Kreps scored 12 points and reached double figures for the fifth straight game as UIC rallied from a seven-point halftime deficit to beat Toledo on Wednesday. It took a pinch of offense from Josh Mayo and Robert Kreps and a dash of athleticism and defense by Karl White Jr. and Jermaine Dailey, but UIC found the right ingredients for victory on Wednesday night. Mayo and Kreps combined for 34 points with 22 coming after halftime as the Flames rallied from a seven-point to post a 66-56 non-conference victory over road-weary Toledo at the UIC Pavilion. Mayo, the Flames’ leading scorer, had just six points at the break and UIC had 10 turnovers in a sloppy display of offense as Toledo grabbed a 32-25 advantage. The Flames did just that as Mayo hit threes on back-to-back possessions to start the second half. 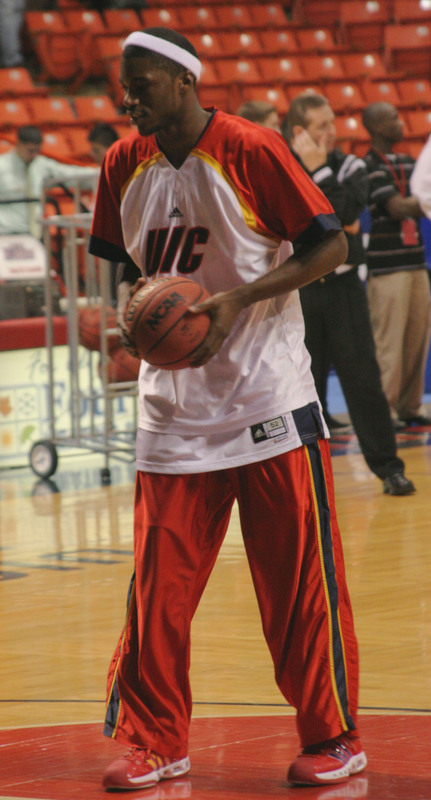 UIC’s point guard Spencer Stewart had five first-half turnovers, including three in the first minutes, but he atoned with three quick assists early after intermission, two of which set up Mayo’s threes. 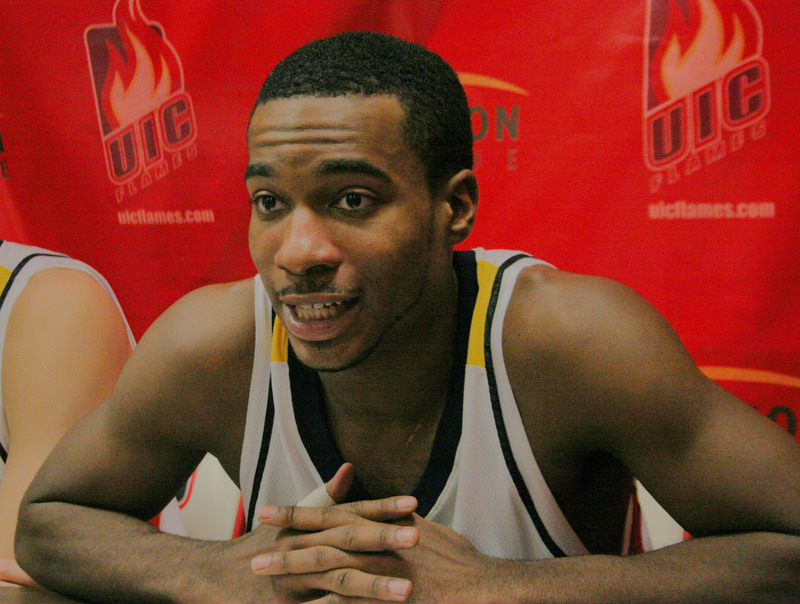 UIC (7-4) cut down on its miscues and also stepped up its defensive intensity. Toledo’s Tyrone Kent, a Crane graduate who scored 13 points in the first half, was curtailed when the game mattered most. Toledo (2-9) took a 39-33 lead on Ridley Johnson’s layup, but Mayo answered with a three-pointer that ignited a 9-0 Flames run. Dailey’s dunk off an offensive rebound gave UIC its first lead at 40-39 with 13:03 remaining in the game. After Kent hit a three-pointer to tie the game at 42-42 with 12:14 to play, UIC went on another run. This one a 14-5 spurt started by a jumper by Jeremy Buttell and capped with two free throws by Jovan Ignjatovic. In between, Kreps scored five points and Mayo hit another trey. When the smoke cleared, UIC had its biggest lead at 58-47 with 6:47 left. The Flames never trailed thereafter, although the Rockets pulled within 59-55 with 3:07 to play, but they did not threaten again. Mayo scored 16 of his game-high 22 points in the second half and ended up shooting 8-for-14 from the field and 4-for-7 from three-point range. Kreps, the freshman from Moroa-Forsyth, added 12 points off the bench for his fifth straight double-figure scoring game. Senior forward Jermaine Dailey played solid defense, along with Karl White Jr., and was key in UIC’s second-half comeback. Scott VanderMeer added nine points for the Flames, including eight in the opening half, keeping the game within striking distance. Dailey and White had solid all-around efforts for UIC. Dailey had six points on two dunks and a tip-in, five rebounds and three blocks and White contributed six points, four rebounds, two steals and a block. Kent led Toledo with 19 points on 7-for-15 shooting, including five threes. Jonathan Amos chipped in with 12 points and a team-high seven rebounds for the Rockets. St. Rita graduate Jerrah Young added eight points. With the victory, UIC has four straight and five of six since the Paradise Jam. Mayo feels the Flames are building momentum because of team unity. Josh Mayo has been dominant at the UIC Pavilion this season. Mayo has made at least three-pointer in every game this season and has hit at least one in his last 14 contests dating back to last season. Wednesday’s game was the first time the Flames had rallied from a halftime deficit to win. They were 0-3 coming in. UP NEXT: The Flames will host Howard at the Pavilion this Saturday at 3 p.m. The Bison is 3-8 after a 77-51 loss at Northwestern. If fans can’t make to the Pavilion, video streaming will also be available on the Horizon League Network and audio streaming will be available on www.uicflames.com. In addition, fans can interact with the live UIC radio/internet broadcast by sending their questions or comments to play-by-play man Adam Levinson anytime at uichoops@gmail.com. Those fans whose e-mails are read on the air will receive an Eli's Cheesecake gift certificate.